Chief Joseph Solomon (right) presents Officer Thomas R. Torrisi Jr. (center) with the 2015 Police Officer of the Year Award from the Methuen Exchange Club for saving Christine Prescott’s (left) life earlier this year. 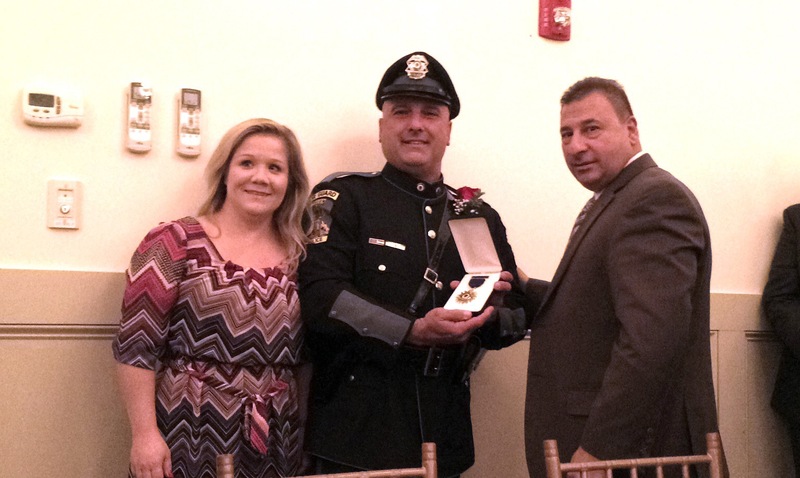 METHUEN — Chief Joseph Solomon and the Methuen Police Department are pleased to announce that Officer Thomas R. Torrisi Jr. was awarded the 2015 Police Officer of the Year Award by the Methuen Exchange Club at a ceremony on Wednesday, Nov. 18. Earlier this year in February, Officer Torrisi responded to a report of a female in cardiac arrest. Upon arrival, he utilized his department AED to revive the woman and, ultimately, save her life. Christine Prescott, the woman whose life was saved, also attended the ceremony and personally thanked Officer Torrisi on behalf of her family and her young son. Chief Solomon presented the award to Officer Torrisi Jr., who has been a full-time officer since 1993. Officer Torrisi is currently assigned to the Methuen Police Department’s Patrol Division, and has been a member of the Methuen Police Department Honor Guard since its inception. Previously, he was a Sexual Assault Investigator for many years. Officer Torrisi graduated from Northern Essex Community College in 1987. Then, in 1990 he became an auxiliary officer with the Methuen Police Department and then a reserve officer before becoming a full-time officer. He graduated from Franklin Pierce College in 1997.